John’s Note: Many people who hunt also fish, and many people who fish also hunt. 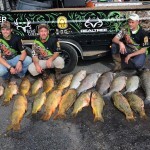 One sport combines both these two sports – bowfishing. Bowfishermen hunt shallow water flats by day and by night and harvest the rough fish that often overpopulate a lake. This group of sportsmen are rarely seen, although many walk or wade shallow flats and shoot buffalo, carp, gar and occasionally catfish. 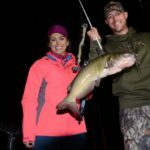 Bowfishing enthusiasts rig their boats out with shooting platforms, extremely-bright lights and generators to light up the bottom to be able to see and harvest the fish. 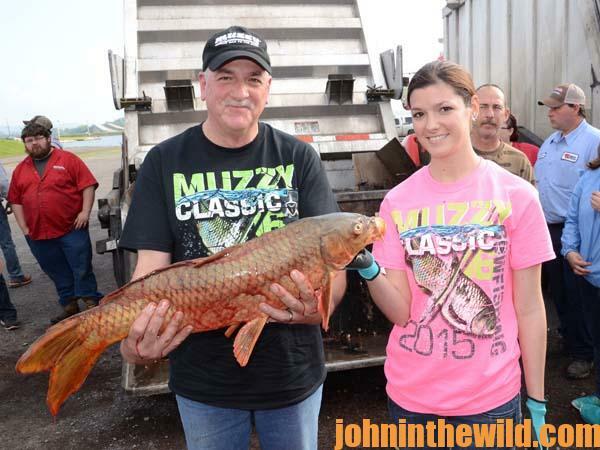 At the end of April, 2015, I was invited to the 16th Annual Muzzy Classic Bowfishing Tournament that drew a record-breaking number of 84 teams from all over the country to compete for a $10,000 first-place prize. 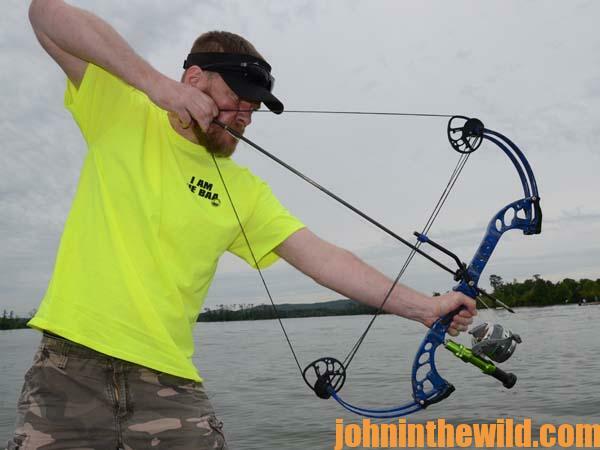 A bowfishing tournament is more than a contest between archers and rough fish but also includes stories, experiences and lessons learned. 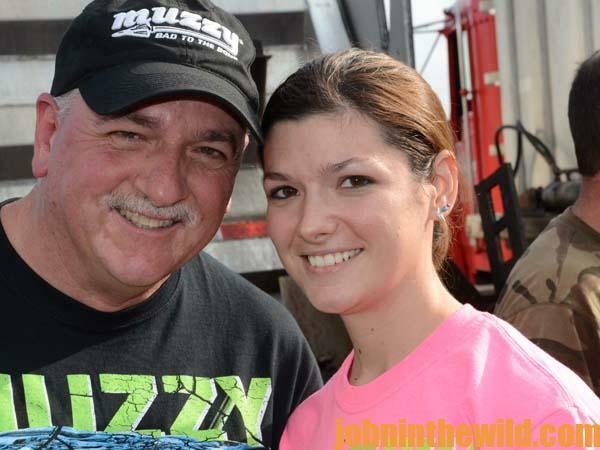 Stan and Heather Bryant make up the Black Saber bowfishing team. “I started bowfishing as a youngster more than 20+ years ago,” Stan Bryant explains. “I’d walk down the banks of a creek and shoot carp, buffalo and alligator gar that I spotted in shallow water.” Stan and his daughter were the 83rd team to register for the 16th Annual Classic with bad weather threatening and rain clouds building. At the last minute Stan and Heather decided to enter the tournament with their 15-foot boat rigged out with lights. Stan shoots a Bear bow, and Heather shoots a Cajun Sucker Punch. Heather’s brother, Jeremy, is 2-years older than her, and he was the child who always went hunting with his dad. “Two years ago when Heather said she wanted to go out and shoot guns with me, I was thrilled,” Stan Bryant says. “I never imagined that Heather had any interest at all in hunting or fishing, and she was a real good shot.” Heather mentions, “Before I didn’t understand how if I loved animals that I could kill them. I wasn’t opposed to other people shooting animals, I just thought that was something I couldn’t do. However, I finally came to the realization that if you use the animals you take by hunting and fishing, then there’s nothing wrong with the sport.” Both Heather and Stan agree that they want to spend more time with each other hunting and fishing now, and that these sports have enabled them to do that. 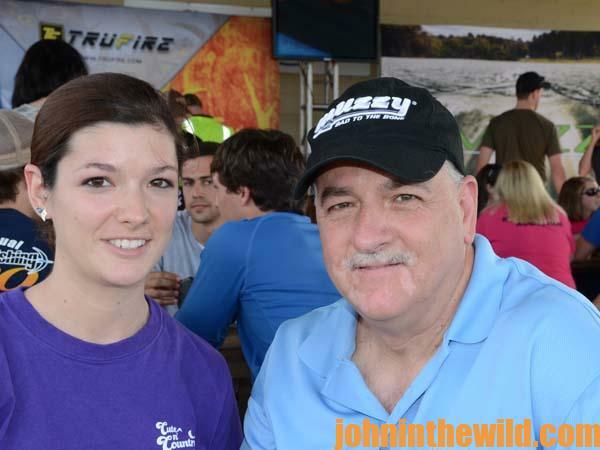 Heather enjoys being with her dad and sharing memories of great bowfishing trips, as well as hunting trips in the fall and winter months. There’s a special bond between a father and his children when hunting and fishing together that’s reflected by the smiles on their faces when they’re outdoors. Bowfishermen come in all shapes, sizes, ages and sexes. 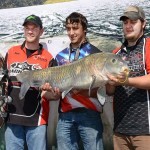 One of the competitors at this year’s Muzzy Bowfishing Classic was 9-year-old Connor Edwards from Cedar Hill, Tennessee, about 30 miles from Nashville, who took a state record Asian carp weighing 36.920 pounds. 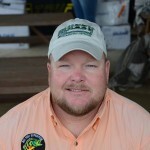 He’d set a Tennessee record on a bowfishing trip before he came to compete in the Muzzy Classic with his dad Ryan Edwards on their team, Shallow Alarm Bowfishing. To get John’s latest cookbooks, “The Crappie Catcher’s Cookbook” and “The Catfish Catcher’s Cookbook” for free, click here. To see all of John’s available print and eBooks, click here.